The US Federal government is receiving pressure to downgrade the status of cannabis. The Food and Drug Administration (FDA) called for comments about marijuana as a listed Schedule 1 drug. It received more than 17,000 comments to its online survey. This survey could change the status of cannabis across the world. The National Organization for the Reform of Marijuana Laws (NORML) collected comments. They hand delivered the comments of 10,000 Americans to the FDA’s Washington offices. These will all go to the World Health Organization (WHO) as part of their investigation. The World Health Organization (WHO) is currently reviewing the international marijuana ban. It will take into account all comments submitted by the FDA and other world organisations. Currently the United Nations (UN) classifies marijuana the same as drugs like heroin. NORML deputy director Paul Armentano said this decision was no longer relevant. He said it did not reflect the current status of cannabis across the world. Armentano believes cannabis should not be on the drug schedule at all. The government FDA website collected a total 17,564 by the time commenting closed on April 23, 2018. All these Americans will have their views heard at the WHO review. The review is still ongoing. The WHO is part of the UN. Its responsibility is setting global health policies and drug standards for UN member countries. WHO’s Expert Committee on Drug Dependence (ECDD) issued the following statement in December 2017: The ECDD did an initial review of a cannabis compound called cannabidiol (CBD). Recent evidence from animal and human studies shows that its use could have some therapeutic benefit for seizures due to epilepsy and related conditions. Current evidence also shows that cannabidiol is not likely to be abused or create dependence, such as for other cannabinoids (such as Tetra Hydro Cannabinol (THC), for instance). The ECDD, therefore, concluded that current information does not justify scheduling of cannabidiol and postponed a fuller review of cannabidiol preparations to May 2018, when the committee will undertake a comprehensive review of cannabis and cannabis-related substances. HempMeds Mexico president Raul Elizalde has a personal interest. Elizalde is a medical marijuana advocate who helped work to legalise medical cannabis in Mexico. He lobbied the ECDD members in person before their meeting. Elizalde’s passion for the industry is not all about making money from his company. He has a daughter who had hundreds of seizures a week until she started using CBD with under 1% THC content. She no longer takes pharmaceutical drugs. And now only has occasional seizures and they are not as severe as before. He understands the benefits of CBD and its safe use. He said keeping cannabis a schedule 1 drug deprives children of a safe treatment for epilepsy. Recently the US Drug Enforcement Agency (DEA) considered changing marijuana from Schedule 1 to 2 at a minimum. Schedule 1 drugs are for substances that have no medical merit. These are addictive, dangerous drugs like heroin and cocaine. Schedule 2 drugs can treat medical conditions when prescribed by a doctor. These drugs can be addictive and have the potential for people to abuse them. Cannabis is still classified as a Schedule 1 drug. All this may change with the WHO’s review of marijuana’s schedule status. This is the first formal review of marijuana since it became a Schedule 1 drug in 1961. A change in status for marijuana could hurt pharmaceutical companies who benefit from its current status. They are profiting from making and selling synthetic CBD and THC products. Anticipation is in the air. There is hope cannabis will move to Schedule 2 at least. WHO’s ECDD meets to make a final decision about marijuana at the UN’s June summit. It will consider CBD and other whole of plant cannabis uses for medical use. They will look at the potential for marijuana dependence and any health concerns it causes. It will also consider the potential medical benefits of the cannabis plant. WHO then makes its recommendations to the UN secretary-general. Before the June session UN members states are sharing their analysis of cannabis. In the US, the FDA called for input from the public about the medical benefits and safety of cannabis. The survey said: The Food and Drug Administration (FDA) is requesting interested persons to submit comments concerning abuse potential, actual abuse, medical usefulness, trafficking, and impact of scheduling changes on availability for medical use of five drug substances. These comments will be considered in preparing a response from the United States to the World Health Organization (WHO) regarding the abuse liability and diversion of these drugs. The result of the WHO’s recommendations could change the status of marijuana across the world. Recommendations should be made to the UN’s Commission on Narcotic Drugs mid-year. Maybe, with the blessing of the WHO, cannabis and its medical benefits will become more accessible to the people of the world. 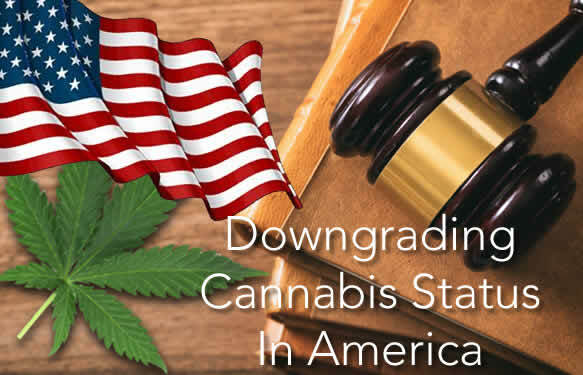 This article about downgrading cannabis status in America was requested from one of our good customer Tommy J.